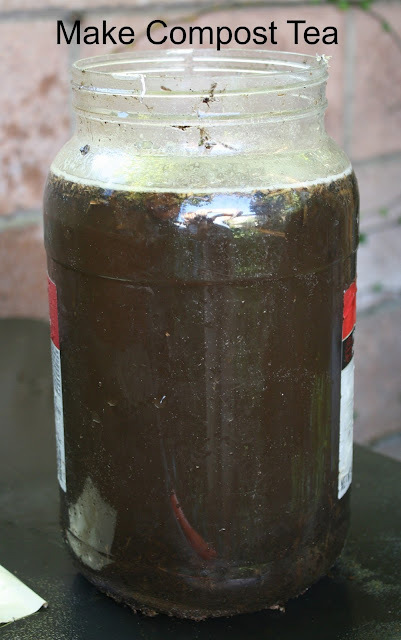 How to make compost tea, the best all natural, free, organic plant fertilizer. You will love what this does for your garden and container gardens. No messy straining bag required to make compost tea. Do it the simple way like me. After reading some of my gardening books I found it is very basic. Here is how I make my liquid gold for my flowers and veggies. I make a gallon sized plastic container almost daily now. I have two I rotate. Take your container and head to your compost pile. If you aren't making compost you need to start. Here is my first compost bin I made myself. I dig down to the bottom of the pile and get some rich dark black gold and drop some in the container. About the size of big handful. Then I take the hose and fill it up and stir well. Do not cover. Compost tea needs oxygen. Stir it a couple times vigorously. If you stir it and mix well you can use it within an hour or two but I usually let it sit over night. Some people like to strain before using but I just go around and pour carefully onto pots and at the end I pour the wonderful compost at the base of a plant. If you have delicate plants like your flower pots I just hose down a little afterwards so the foliage doesn't burn. Other than that, for my veggies I pour at the base of the plant or back in the compost pile. This is full of nutrients but also beneficial organisms and totally organic. And free fertilizer for your garden. I have not bought commercial fertilizer in years. I have lush full containers every year. You can see some container gardening and frugal gardening tips in other posts. When your flowers just get ready to bloom than use my homemade flower fertilizer to give you loads of blooms. Update: Since I no longer have chickens and don't create the compost I used to, I know use these easy tea bags made from compost as fertilizer for my vegetable garden. For my flowers I use my homemade flower fertilizer recipe. It does wonders for the garden!!!! I think I need to start composting now that I am retired and have the time. It is liquid gold! Thanks for the recipe! I couldn't get to the link of your compost bin though. This is fantastic stuff...but under no circumstances should you serve it over ice;>) lol. I have a compost pile and I haven't been making this! Why didn't I think of that? I compost but I rarely make this. I need to start doing this again! Wow, your container plant looks awesome! Such beautiful blooms. I really need to make some compost tea for my garden as well. I think I told you before I make manure tea...thanks to the cows out back. But much handier is my compost bin...and I was also curious how you did this. So thanks! I'm going to start doing this too! Thank You for showing how you do this. I have never made compost tea in all my years of gardening and have wondered. We have bad soil in several large areas around the farm and Kris taught me how to compost and now I am so excited that I know how to make the tea. Compost tea...here I come. I haven't done this for the longest time! Thanks for the reminder.